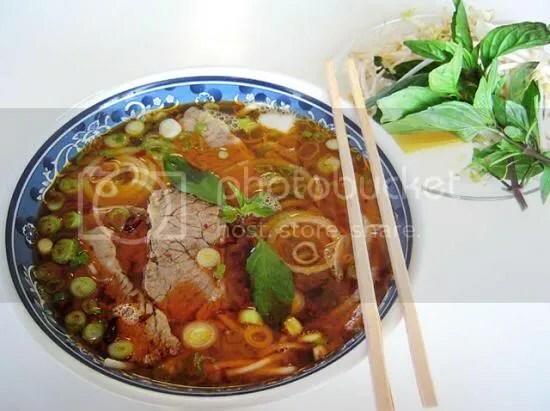 Bun bo Hue (Hue style beef vermicelli) or more detail, Bun bo gio heo (beef and pig’s knuckle vermicelli) is a popular Vietnamese soup vermicelli dish, and one of the most typical foods of Hue, Vietnam. Fine combination of ingredients make the food famous; the broth is prepared by simmering beef and bones for a long period of time, after that a large range of different spices containing lemongrass and chili are added in. Shrimp paste holds no less importance. Hue people usually add thin slices of beef shank, chunks of boiled oxtail, and pig’s knuckles or pork into the bowl. It can also contain cubes of maroon brown congealed pig blood, which are good for those suffering from high blood pressure. The specialty is commonly served with a plenty of herbs like sprouts, lime wedges, cilantro sprigs, onions, and sliced banana blossom. Thinly sliced purple cabbage or iceberg lettuces are used in case of lacking in banana blossom. 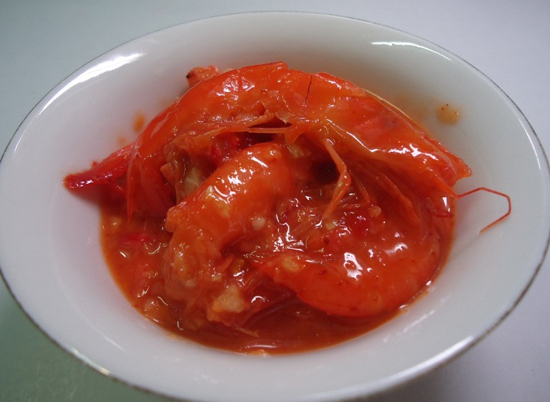 It is highly recommended for tourists to add a few of shrimp paste directly into the soup. Nem lui (lemongrass skewers) is made from succulent pork molded around lemongrass sticks. To enjoy this dish, you are suggested to take a small and thin piece of “rice paper” to wrap it with fresh vegetables, thin slice of star fruit, chilly, etc and roll it up to put in the special sweet and hot liquid sauce called “nuoc leo”. Nuoc leo generally made of tens of different ingredients such as vegetable oil, sugar, coconut water, fish sauce, vinegar, pig liver, cinnamon extract powder, etc. This liquid sauce is extremely attractive for food lover thanks to its special taste and diversity of ingredients. Bun thit nuong (vermicelli with grilled pork) is a mixture of rice vermicelli, grilled pork, fresh vegetables and other special ingredients. Bun thit nuong has no broth, but a sauce made by grinded peanut. The pork is mixed with some ingredients to be tastier and then be grilled on fire. A bowl of bun thit nuong includes rice vermicelli in the bottom, some pieces of grilled pork above, kinds of fresh vegetable around and the sauce on the top. When eating, you should add a little chili sauce and lemon squash then mix all of them together to enjoy the special flavor of the dish. On the 13th January of the lunar calendar, the most important day of festival, many solemn rites were held in the communal houses of Dinh Ca and Lo Bao that attract a large number of locals and tourists as well as cultural experts. 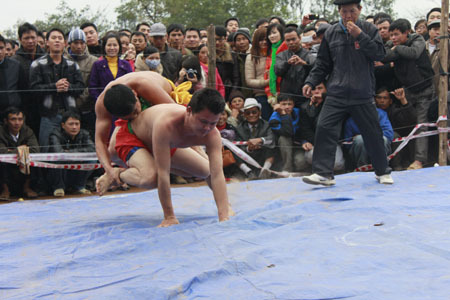 Besides, there are many traditional entertainments on the Lim hill, such as Vietnamese wrestling, singing Quan ho folk songs, swinging, blind’s man bluff, playing human chess and the puppets of Dong Ngu on the central stage. Quan ho folk songs are sung by “Lien anh” (Brothers) and “Lien chi” (Sisters) on Tien Tuong river. Human chess was played as Chinese chess but chessman is villagers. This game is set up on main yard of village and controlled by old people. 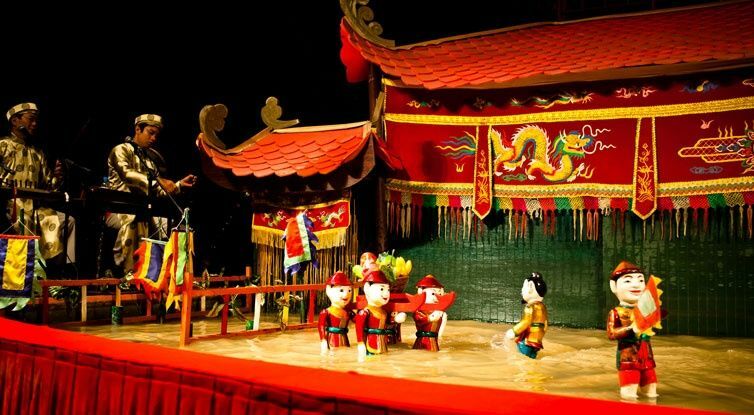 Water puppet show of Dong Ngu artists is one of interesting entertainment. Dong Ngu village is the oldest water puppet village in Northern of Vietnam. 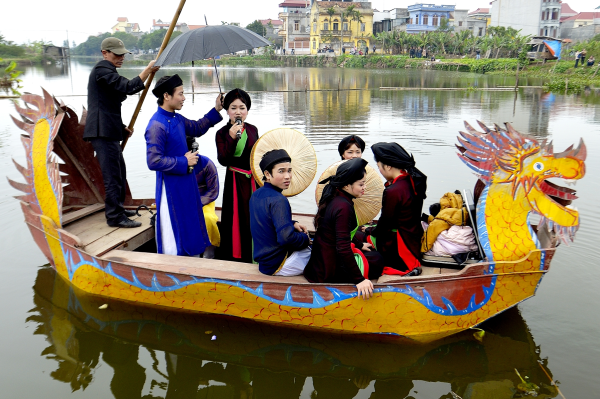 Most of tourists want to go to Lim festival in order to enjoy the sweet melodies of Quan ho in the area of Kinh Bac which is considered the cradle of this artistic genre. During the festival, besides the major stage, the festival’s organization board also created four others where a series of Quan ho songs, such as “Moi trau” (Inviting a quid of betel and areca), “Vao chua” (Going to the pagoda), “Gia ban” (Goodbye to friends) and “Ngoi tua man thuyen” (Sitting near the boat’s side) were performed. 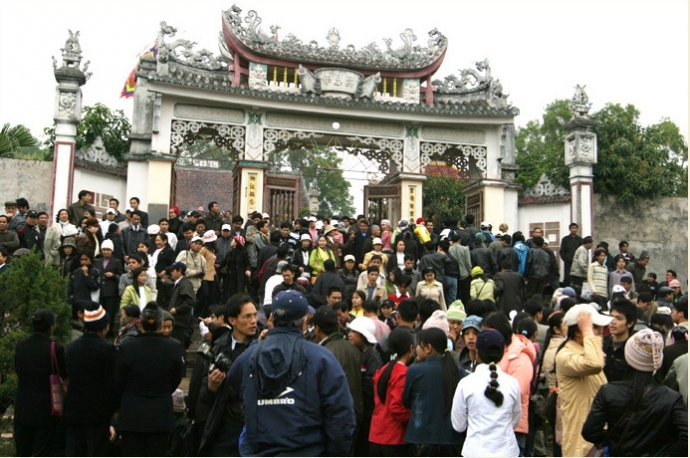 Furthermore, Quan ho singing performances were also held at the courtyard of communal houses and pagodas, houses of artists and on boats in many villages, such as Lung Giang, Lung Son, Due Dong, Dinh Ca, Lo Bao, Due Khanh, Hoai Thi, Hoai Thuong, Hoai Trung and Ba Uyen. 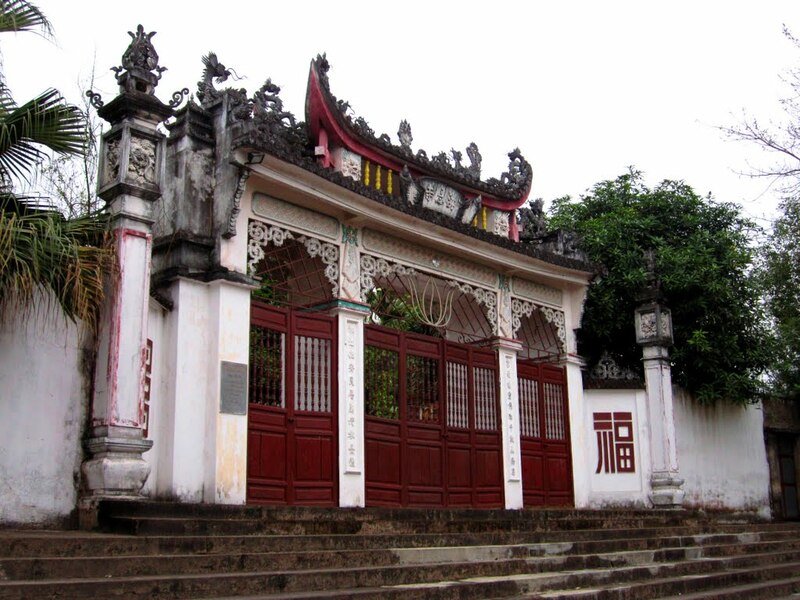 Lim Pagoda has legendary stories about a heroine of Lim village. 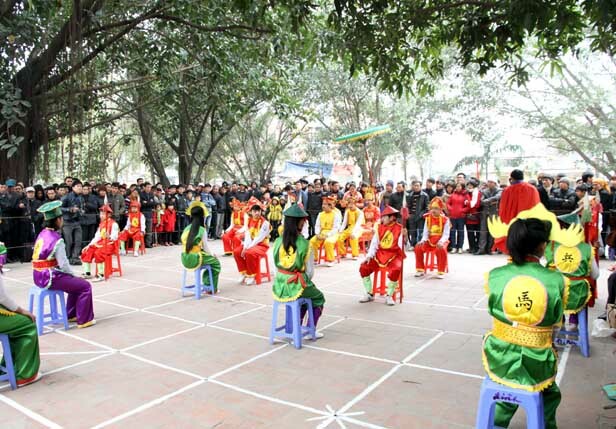 Nowadays, most of people believe that holding this festival is the best way to promote Quan ho songs- one of Vietnam’s intangible cultural heritages to all over the world. However, the main purpose of Lim festival is to Lim Festival aimed to worship Ba Mu, a child of Noi Due hamlet who led her religious life as a Buddhist nun at Lim Pagoda. After acquiring enlightenment, Ba Mu protected all residents within Lim Village from a severe drought. As a result, Lim villagers glorified Ba Mu as their guardian, and the enlightenment date of hers was taken to be the celebration day of Lim Festival. If you have a chance and are interested in studying culture, Lim festival should be included in your itinerary in Vietnam. If you are finding a place in Vietnam to spend a few days at a beautiful beach and you are tired of crowded Halong Bay or Nha Trang or not interested in a plain beach in Vung Tau, then Phu Quoc Island will be a great option for you. Lately, Phu Quoc island is designated as a special economic zone and it is the only place in vietnam where foreign travelers are eligible for a 30 day visa exemption. In order to be eligible for the exemption,all visitors must fly from an international destination and arrive directly or indirectly (via transit) to Phu Quoc. Their stay cannot exceed 30 days and they must depart Phu Quoc, either directly or indirectly (via transit), to an international destination. Under this policy, visitors are not allowed to enter mainland Vietnam nor any island part of Vietnam outside of Phu Quoc District (e.g. Nam Du. Hai Toc. con Dao. etc). The 30 day visa exemption also applies to those traveling with authorized tour groups and international cruise ships that will dock at Phu Quoc. So, when to go to Phu Quoc? There are two main season on this island – Rain season will start from April to September and Dry season starts from October to next March. However, you can visit this island at any season because the average temperature is around 27 degree and the rain doesn’t last long. Now, how do we get to this island? The easiest way is taking a flight, from your home or you can choose many domestic flights from Hanoi, Hue, Danang, Cam Ranh, Ho Chi Minh and Can Tho to get on this island. There are more flights from Hanoi and Ho Chi Minh, while from other city, there is only one flight and on some days, it will not be available. Another way is cruising from Mekong Delta then take a speedboat (Superdong) from Rach Gia or Ha Tien Pier to get to Phu Quoc. A popular itinerary is we start from Ho Chi Minh city, then drive to Can Tho or Cai Be town to embark your cruise in there. You can have 1 or 2 nights on boat then after the cruise, they will take you to Rach Gia and help you get on the speedboat. Superdong is the only speedboat to Phu Quoc and their services is pretty good. The boat is nice with big seat. The trip is a bit bumping and lasts for 2 and a half hours but this will give you an interesting experience. Especially, if you want to have time to do snorkeling in Phu Quoc, a speedboat will be a good solution than wait for next day to take a flight back to mainland. In my next post, we will find out what is must do on this beautiful island and more!